In the first part of this thread we discussed the symptoms of ASD, and the “natural history” of improvement over time – first noted by Leo Kanner in 1943. In the second part of this thread, we introduced the idea that IQ is independent from atypicality. Every individual with ASD has a unique combination of degree of atypicality, and level of intelligence. We can depict this relationship using an XY graph, with severity of atypicality on the horizontal (X) axis, and IQ on the vertical (Y) axis. IQ is the single biggest factor influencing long-term outcome in children with ASD. This has been known since the 1970’s. Think of atypicality like a hunk of ice, floating in the water. The severity of the atypicality is equivalent to the size of the hunk of ice: it can be a huge iceberg, or a tiny little piece. Think about IQ as being equivalent to the water temperature: freezing cold = low IQ; warm, tropical water = high IQ. Now ask yourself: If we start with two identical hunks of ice, and drop one into the Arctic Ocean and the other into the Caribbean, which will melt faster? The answer is obvious. Figure 1. The warmer the water, the faster the ice melts. ASD is like the ice; IQ is like the water temperature. 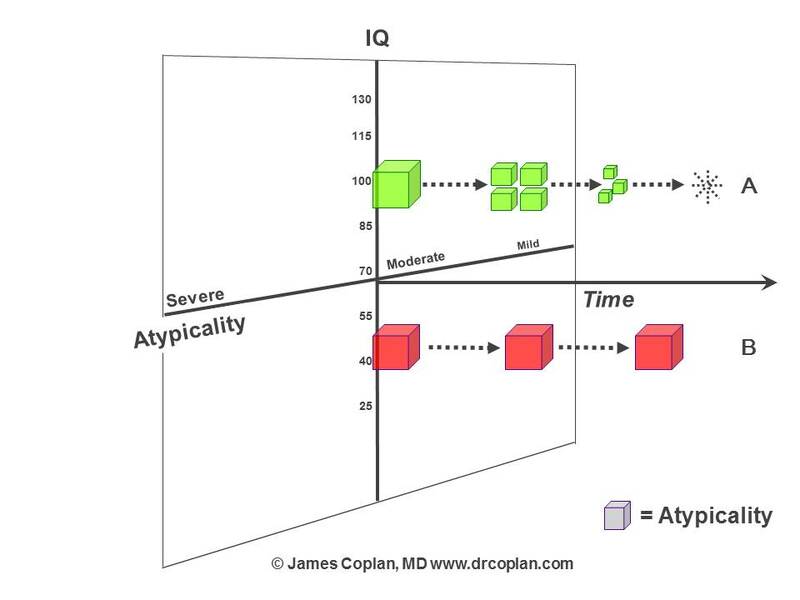 The same is true for two children who start out with the same degree of atypicality, but different levels of intelligence: Atypicality will “melt” faster in the child with the higher IQ, and slower (or sometimes not at all) in the child with lower IQ. We see this depicted schematically in the diagram below. In this diagram, I have taken the XY graph that I showed you in Part II of this thread, and added a third (Z) axis, to represent age (or, time). Child A and Child B both have Moderate Atypicality. Child A has an IQ of 100; child B has an IQ of 50. Not only is it better to have an IQ of 100 rather than an IQ of 50 for its own sake. The child with a higher IQ reaps an additional benefit because his or her atypicality fades over time. The child with an IQ of 50 as well as atypicality suffers a “double whammy,” because he or she has to deal with persistent atypicality, in addition to low IQ. The “ice” doesn’t melt very much or very fast. Part of the challenge in evaluating different forms of therapy for ASD stems from that fact that subject selection — rather than the therapy itself — often predetermines the outcome. If you pick your subjects all to be like Child A, you can make any therapy look good! This is an issue we will come back to later, when we talk about quackery. For now, it is sufficient to note that when we want to address a child’s needs over time, we need to consider both the degree of atypicality and the level of IQ. Teens and young adults like Child A have the best long-term prognosis. However, even these individuals (some of whom “outgrow” the defining behavioral characteristics of ASD), face significant challenges in later life. More on this next time.